My attention was very early drawn towards this subject, from several Gentlemen in my neighbourhood being among the first speculators in Guiana. Of these, some never had any fortune, & others had exhausted what little fortune they were possessed of, yet, with very few exceptions . . . they all returned speedily with larger & some of them with immense fortunes. 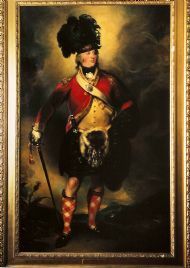 The 'first speculators' from Lord Seaforth's neighbourhood, the Highlands of Scotland, included the Frasers of Belladrum, George Inglis of Inverness, Alexander Macrae of Inverinate, Thomas Cuming, Lachlan Cuming, Spencer Mackay and John Sutherland. According to the Dutch historian Netscher, writing in 1888, English settlers from Caribbean islands with depleted soils and high taxes began to establish themselves in Guyana from the 1740s, first on the island of Wakenaam, then on the coast of Essequibo. This was followed by settlement in Demerara. Nescher blamed the eventual loss of the colonies to the Dutch on the deep rooted 'English' presence – the term 'English' covered all British settlers. Berbice was the oldest of the three Dutch colonies and its growth was modest until the 1730s when coffee production expanded. The Berbice slave rising of 1763 and an epidemic of fevers and dysentery led to a decline in the population of both slaves and planters. Dutch planters in the colony were suspicious of outsiders – Jews and Roman Catholics were forbidden to settle there – and British involvement in Berbice did not begin on any scale until the 1790s. Berbice was ‘one of the most unattractive colonies in the New World’ – subject to fickle changes in weather and epidemics of disease [see Alvin O Thompson, Unprofitable Servants: Crown Slaves in Berbice 1803–1831 (Kingston, 2002)]. As in many colonies, networks of family, friends and acquaintances from the home country were an important means of doing business, especially for new arrivals – and, because few made this place their home, there was a continuing stream of young men arriving from Britain. As a consequence, effective networks were even more important. 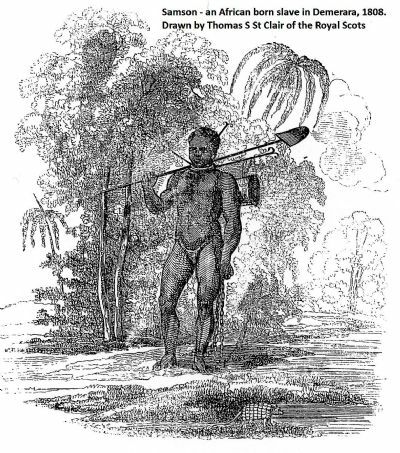 Henry Dalton recognised this when he wrote his History of British Guiana [London, 1855]. He knew of some former slaves who had set up in business hawking fish and who called the large shrimps they sold 'Scotchmen' – because of the way in which they clung to each other and were difficult to prize apart. An unflattering view of Scots settlers decending on London and the colonies, including the West Indies: Richard Newton, 1796. Dalton also pointed out that Scots were the most numerous and, in many ways, the most successful of the Europeans in these colonies but he believed that Scots in Guyana had retained none of the characteristic virtues of their nation. Their reserve, simplicity, sobriety and zeal for religion all disappeared in what he called the 'vortex of dissipation' of plantation life [Dalton, p308]. 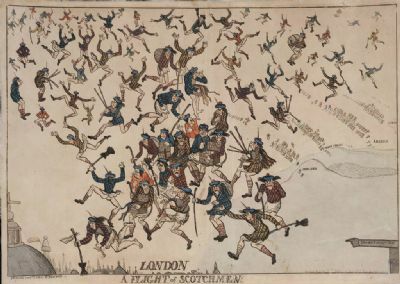 Charles Waterton had a similar view and described how ‘shoals’ of poor Scotsmen arrived in the Berbice, hoping for sudden wealth, and how once forty of them lay on the beach and drank rum until they were all dead. [Julia Blackburn, Charles Waterton, 1997 p27]. One aspect of this is the many examples of brutal mistreatment and abuse of enslaved Africans by Scots. The conduct of these Scots was often shocking – but this should not be surprising because we know that 'under certain conditions and social pressures, ordinary people can commit acts that would otherwise be unthinkable' [Philip Zimmardo, The Lucifer Effect: Understanding How Good People Turn Evil, Random House, 2007]. This effect is, however, more visible in colonies such as Demerara, Berbice and Essequibo, which were on the 'edge' of the British Empire and where the risks, and sometimes the rewards, were higher.